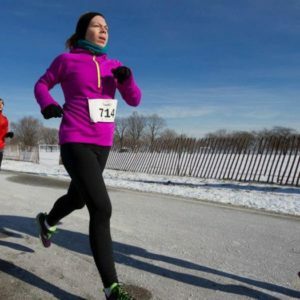 Last Saturday, I ran the F^3 half-marathon along the lake front in the bitter cold. Despite the frigid temps, it was a beautiful, sunny day. The race was at 10am – a welcome time compared to a more typical start at 7 or 8 am (I am not a morning person) – so it allowed plenty of time for pre-race fueling without having to rush to the starting line. As a dietitian and a runner, I’m often asked what I eat, particularly pre- and post-workout. For me, it all depends on the workout. If it’s after work and before dinner, I know I’ll need something to tide me over so that I’m not spending the whole workout thinking about what’s for dinner. If it’s the rare moment I wake early for a 5:30 am workout, typically I go on empty. All in all, I think it depends on you, how you feel and what your goals are. Post workout, I do try to eat a balanced meal that includes lean protein, healthy fat and complex carbs as soon as possible. Why? Research shows it’s beneficial for recovery and rebuilding muscle. Here are some tips and meal/snack suggestions for pre- and post-workout nutrition to help maximize your exercise and performance. Fitting in a quick workout? (<30-45 minutes) Depending on when you last ate, you might be ok going on empty. A slice of toast or medium apple with a heaping teaspoon of your favorite nut-butter. Intense workout planned and you just woke up? When I lived in TX, I joined a running group. We did all our long runs very early in the morning to avoid the heat. The easiest thing for me to eat, even when I wasn’t hungry, was a large banana. It’d provide me enough fuel for the run. But if I was planning on running for more than 90 minutes, I paired the banana with a small bowl of cereal, otherwise I would run out of energy before the run was finished. Large meals – Eat these at least three to four hours before exercising. Small meals – Eat these two to three hours before exercising. Small snacks – Eat these an hour before exercising. After your workout it’s important to help your muscles recover by replacing their glycogen stores. How? Eat a meal, if possible, that contains both protein and carbohydrates within two hours of your exercise session. If you aren’t hungry after your workout, try a drink that contains some protein and carbohydrates – like chocolate milk. Why? One reason post-workout chocolate milk is beneficial is because of its protein content. Every cup contains between 8 and 11 grams of protein. A 2007 study published in the American Journal of Clinical Nutrition found that, when taken immediately after exercise, milk-based proteins promote greater muscle protein synthesis than soy-based proteins. 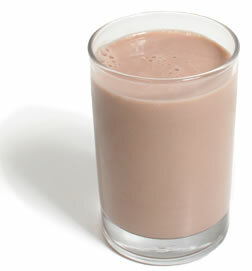 For more science behind chocolate milk, visit: http://www.gotchocolatemilk.com/science. Stick with water–unless your workout is over an hour. Then you might benefit from a sports drink to help maintain your body’s electrolyte balance. I typically switch between water and a sports drink during long runs because I’ve found that if I stick to just the sports drink, I tend to get an upset stomach. Everyone’s different when it comes to eating and exercise. Pay attention to your body and your overall goal. Are you trying to lose weight? Then keep calories in check and make sure you are burning more than you are taking in. Trying to maximize your workouts? Make sure you are adequately fueled pre- and post-workout. And either way, don’t over-compensate post-workout with extra helpings – it can be tempting – but can also sabotage your efforts. Happy exercising and eating! Allison is a Board Certified Sports Dietitian with a big appetite for good food, nutrition, running and life! great blog — provided lots of tips to implement right away! Thanks for the great tips! I definitely need to get in more water during and after workouts! Excellent info! I am running the Naperville half marathon in November and will definitely be following these suggestions! That is interesting that milk based protein provide better synthesis than soy based proteins. Do other animal based proteins (meat/chicken/fish) also provide better synthesis? Any comparisions between meat protein and milk protein? Excellent read! Thanks for the awesome suggestions! This is a great article – as one who struggles to run regularly in the winter, this information was very useful. Thanks!! Great info and suggestions. What would be an alternative for someone that doesn’t like milk? 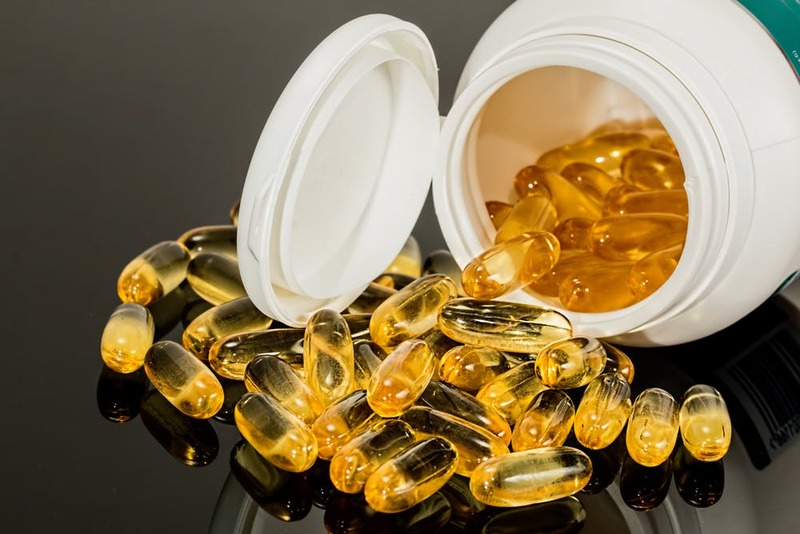 How do you feel about vitamins?